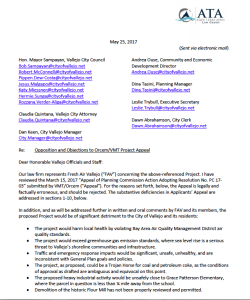 Fresh Air Vallejo’s Attorney writes a strong letter to the City of Vallejo stating that the VMT/Orcem appeal that was filed after the Planning Commission hearing in March is legally and factually wrong. So, do we all still have to come to the May 30 & June 1 meetings? Yes. Do we all still have to speak at those meetings and repeat what we said at the Planning Commission meeting? Yes. We need to add our might behind our City Council so they feel supported to make the right decision and protect the people of Vallejo. Below is a PDF of the letter.